Ford Ranger Rock Sliders: Protect Your Ford Ranger with Rock Sliders, 2019 Ford Ranger! looking for 2019 Ford Ranger Rock slider? Scroll down, see below. 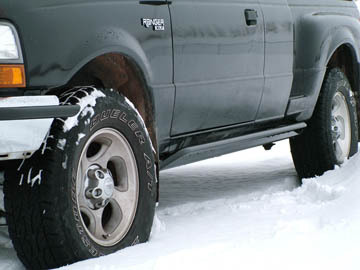 Rocky Road Ford Ranger Rock Sliders are the creme' de la creme' of the rocker protection world. We use 3/16" inner hitch steel to make sure your bars do NOT bend! Anything other than hitch steel is just plain flimsy. Most other Ford Ranger Rock Sliders are made from thin 1/8" wall tube material. Alot of shops refer to these as Nerf bars. an appropriate name since they will ofer about as much protection to your vehicle as a Nerf toy product would. Supersliders as pictured. Click for larger view. Notice the excellent side protection from the Superslider kit. Tucks up nice and tight to the body too for maximum clearance. 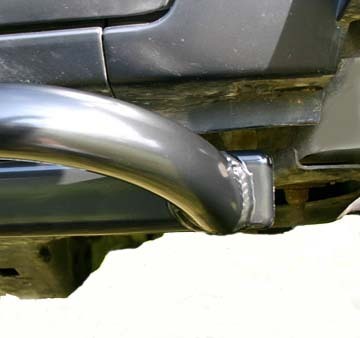 A good number of the Ford Ranger Rock Sliders we sell are to those who have actually bought these thinner bars and have bent them up. Even slick looking dual tube designs that appear to offer better protection are still only made from 1/8" steel on the slider tube and will bend on a hard impact. Ford Ranger Rock Sliders Best looking style! 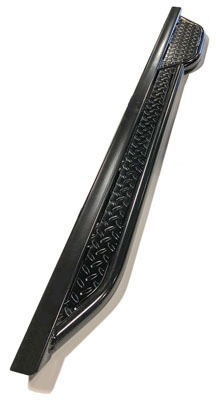 Our Rock Sliders have a very sleek rounded look about them as we use genuine inner hitch steel in their construction. Hitch steel is not only very strong, it also has a nice radius corner instead of a hard boxy look. Inner hitch steel is the stuff you use to plug into 2" receiver hitches. Its sheer weight is astronomical as is its bending strength. Our shop press goes to 50 tons and we can't even start to bend them. Do you think a scrawny little rock can hurt these things? Think again! Supersliders mounted up on Matt Cawley's sweet looking Ranger. Does it bear a faint resemblance to the vehicle at the very top of our webpage? Hmmm.... Nice eh? Ford Ranger Rock Sliders, Strongest design! Our rock sliders are very simple to install and are completely 'bolt on'. Our rock sliders mount on the sub-frame as well as along the body seam. Not mounting along the entire seam causes extreme stress with the leverage of an impact on the outer rocker itself. Our design distributes the load across a broad area instead of focusing it on small spots. Installation is made easier on many of our kits by marking strips which we include with every set. Instead of trying to juggle a 35lb rocker bar in place while you mark your holes, you simply clamp our thin steel marker strip onto the body seam and mark your mounting holes. We use existing mounting holes whenever possible to minimize drilling on the vehicle. However, we don't sacrifice mounting strength so save a couple holes. 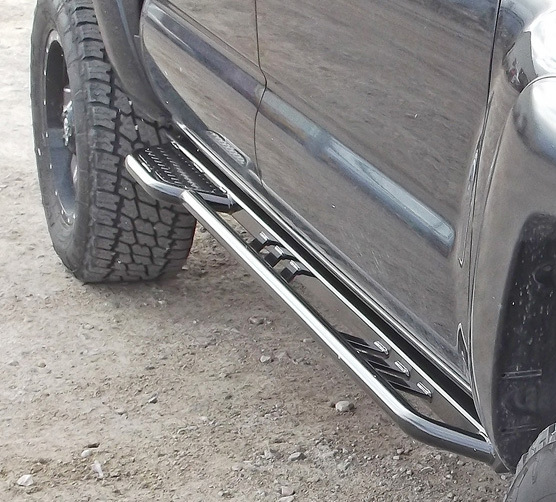 Ford Ranger Rock Sliders, Best looking! Another shot of Matt's Ranger all Pre-runner'd out. Click the pic for a larger view of the Rocky Road Supersliders! 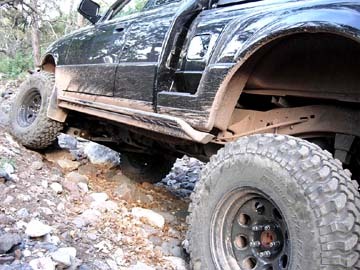 You'll find our rock sliders very attractive and will blend in nicely with your stock flares and moldings. Most all will run fender to fender and many folks have commented on their very OEM (factory) look. We tuck them very tight to the body to minimize the possibility of getting hung up. Pictured at right is an example of an engineering detail of the Rocky Road rock slider kits over others on the market. This just helps demonstrates one of the many superior engineering points in our system. Now take a look at the lower picture at right. This is from a competitor. Same pricing for the rocker kits, but they cut their production costs by making the end a blunt square. Run that thing into a rock and you can clearly see the trouble you will face. Its a battering ram, not a rock slider. It could stop your vehicle cold or require you to bash away until something gives. Why would they build their kits with this engineering defect? Simple... its cheaper to manufacture with the flat end, so that's what they go with. Our Rockrails have been installed and reviewed always with the highest marks by offroad magazines, websites, chat forums, etc. Rocky Road Rock Sliders are the strongest, thickest, and most protective bars on the market, with best mounting system, and are guaranteed NEVER to bend. 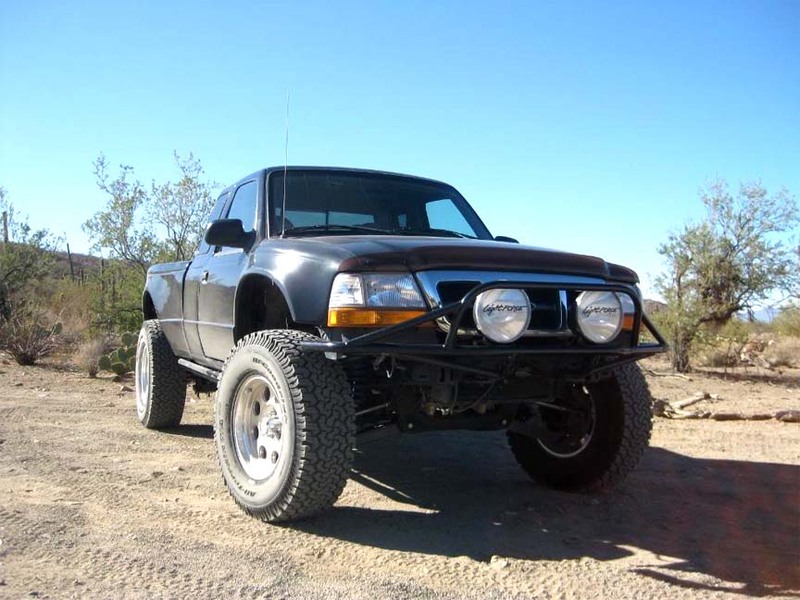 Ford Ranger Supersliders and Kicker Rock Sliders. These rocker bars offer all the strength and warranty of our regular Ford Ranger Rock Sliders, but with the added bonus of an additional upper tube. This upper tube can provide even more protection against sliding into rocks, trees, or other trail hazards. Pictured left are the Kicker Rock Sliders. Great Protection, Excellent use as a step, Diamond plate rear. They also make an excellent step for access to roof racks and such and the Kicker Sliders feature a Diamond Plate rear. Each Super Slider kit mounts identical to the standard Ford Ranger Rock Slider for the vehicle. It also still features that great looking 45* front and rear edge. Not only good for looks, but alot more practical for trail use than our competition's squared off ends. This is basically the same proven design as our world famous Rock Slider, only with the extra slider tube up top. All photos are of the Superslider or Kicker slider kit on this webpage. 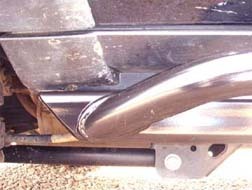 Standard Rock Sliders do not have the additional round tube bar. Our regular Rock Slider kits consist of the main 2x2 square slider tube. Same great strength, tight fit, protection, just without the additional outer tube. Kits available for Rangers 1998-2011. If you live in the SLC area and have a model/year Ranger different than our offerings, please contact us and we may use your truck for prototyping which means you get a free kit, installed! We are DEFINITELY looking for a 2019 Ford Ranger for design and prototyping! Get a free kit, installed... contact us!! !